Home Food What Time is It? It’s BOBA TIME! No matter the day, no matter the hour, something beckons to you. It's me, milk tea. And it's boba time. Hello, hello, thank you, thank you all, this is a real treat. So many great stars and talented folks in this room. Thank you. Wow. I'm honored. Thank you. It is one of life's greatest struggles. You're perhaps in between meals, or, perhaps, after a meal. But, you aren't complete. Aren't whole. Aren't satisfied. Yet, you're not hungry. The balance of your entire physiological system is in limbo, and the wrong move can set everything off. So what do you do? You try to find the perfect snack or dessert to allow you to do the one thing living organisms have tried to perfect for millions of years: survive. That is what we are here tonight to award. The ones who don't stand out as full meals but bridge the gap. The ones who seek to bring peace to our already troubled world. The true heroes we don't deserve. Let's find out more. Cold as your ex's heart, creamy as your grannie's mashed potatoes. Ice cream is loved by kids, adults, dogs--but is it enough to win? Can we? Yes we VE-GAN!!!!! Talk about affordable--walk into any Ralph's and get a bag for less than three Washingtons; can you even get half a Jamba Juice smoothie with that? Weird dry ice dragon ball breath thingies have been a hit because we all know to do it for the gram. This dessert comes in strong because the only thing kids should smoke is clowns like you on the basketball court. AND HIS NAME IS JOHN BOBAAAA!!! Coming in at 7 inches tall (and a foot with straw) and weighing approximately 24 ounces, we introduce a heavyweight contender that you're all familiar with. Boba boba boba, can't you see that your tea just hypnotizes me? Whew. Whew. Tough choices. That's what makes this night so great. Wow. Oh man. Look at The Rock. If he could choose all four, he could! Wow, wow. You know, I knew when I first opened It's Boba Time that it would be a wonderful addition to Gardena. I mean, first, you have this awesome location with a bunch of other amazing Asian restaurants--and Marie Callendar's. No, no, I love their pumpkin pie. But anyways, seriously, our name is so redunant. It's Boba Time? It's ALWAYS boba time!!! I mean, where can you even go wrong? First up, the classic cookies 'n cream smoothie is bomb and out of this world. Throw some honey boba in there, and our customers go wild. In fact, any of our smoothies are pretty dang good and definitely the best in the area. And the milk tea? Oh honey, we do milk tea. I mean, it may not be the most crazy amazing milk tea in the world, but guys, you know it's solid and you know you love it. The boba itself is where we do well. It's soft without that over-chewy sensation you get a lot of times, and it definitely isn't a rock like our friend Dwayne in the audience. 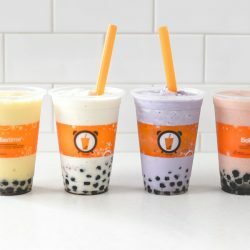 Overall, we're a fun little boba shop that is just all-around solid, and best of all, we don't charge extra for adding boba to your drink. That's our guarantee. Thank you everyone.